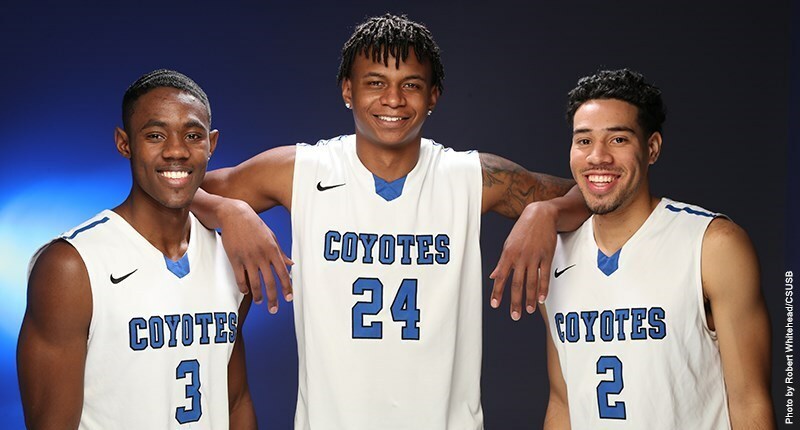 The Coyote men’s basketball season has officially ended, and with it comes the ending of a CSUSB basketball career for three senior players. Everett Turner (#3), Ramon Eaton (#24) and Shawn Joseph (#2) will be leaving the Coyotes basketball program. Turner, a finance major from Fontana, was a standout player for CSUSB. In his freshman year at Cal State Dominguez Hills, he started in 21 of the 25 games he played. As a sophomore, he moved to CSUSB and averaged 9.3 points, 3.2 rebounds, 2.7 assists (71 total) and 1.9 steals (49 total) per game, which earned him a spot on the 2015 CCAA Honorable Mention Team. Turner’s senior year for the Coyotes was impressive. He increased his stats from the previous years in every category: 11.8 points, 4.7 rebounds and 3.4 assists. He earned CCAA Honorable mention for the second straight year, being the only Coyote on the squad to be recognized by the CCAA. “Everett is a big part of our team,” stated head coach Jeff Oliver. Turner reflects on his favorite moment from his career, which is when he earned CCAA Player of the Week. He’s not sure what his future holds for him, but would love to continue his basketball career upon graduation. Eaton, a psychology major from Sacramento, played his final year of eligibility with the Coyotes. He previously played for Pepperdine, New Mexico Junior College and North Carolina Central before transferring to CSUSB for his senior year. Eaton played in 28 games for Pepperdine and 13 at North Carolina Central. He played in 24 games, starting 20, as a Coyote and averaged 8.3 points, 4.3 rebounds and 1.3 assists per game. “It showed character and heart to all the younger players; even though the odds were not in our favor, never give up and to play with heart, always,” added Eaton. Joseph, an entrepreneurial management major from Riverside, was a three-year member of the Coyotes basketball team. He played a season at Riverside City College, playing in 23 games. His sophomore and junior years, he played in 18 games for the Coyotes. His senior year he played in 20 games for the Coyotes and had a season-high 29 minutes against Cal State East Bay. The Coyotes finished their season with an 11-14 overall record and in 10th place in the CCAA.